The Thermal Installations Regulation in Buildings (RITE in Spanish) lays down the conditions that must meet the installations designed to meet the thermal welfare and hygiene demand through the heating, cooling and hot water for a rational use of power. According to these regulations we have made a Humidity & Temperature Module integrated with our platform that will let us show the required information about temperature and humidity of the building and also use digital signage at the same time. 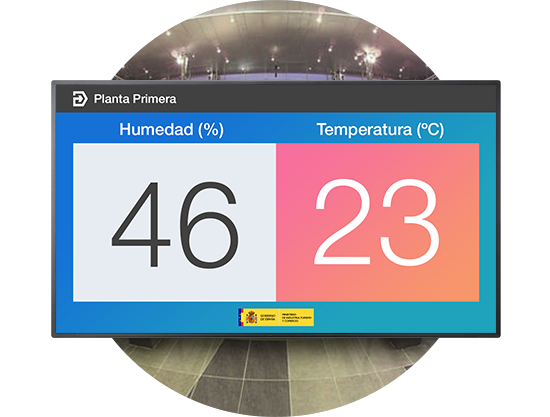 The system allows to use a part of our screens to show the Humidity & Temperature information and use the rest for advertising, corporate messages, promotional videos or whatever our interests. Limitar el rango de temperatura y humedad en edificios y locales públicos de pública concurrencia de más de 1000 m2 y a exponer los valores actuales en una pantalla no menor de 297 x 420 mm.